Josh Bell, known to family and friends as “Filthy McNasty” is poetry-in-motion on the basketball court. Only his twin brother, and chief competitor, Jordan can compare in skill. Cheering them on is their father, former basketball standout Chuck “Da Man” Bell. Between the brothers, their middle school team is destined to be that year’s champions. Life, however, has a way of throwing a wrench (or two) in the works and Josh finds that his talent on the court will not be enough to get him through. He needs to dig deeper. This is a coming-of-age story that reflects the importance of family in a time of change. As a rule, I’m not a fan of novel-in-verse books…or of basketball stories. However, I found myself really liking this book. It was fast-paced, energetic and I enjoyed the rhythm of the prose. Even the text design enhanced the story. Overall, I didn’t feel like this was just a bunch of poems slapped together. 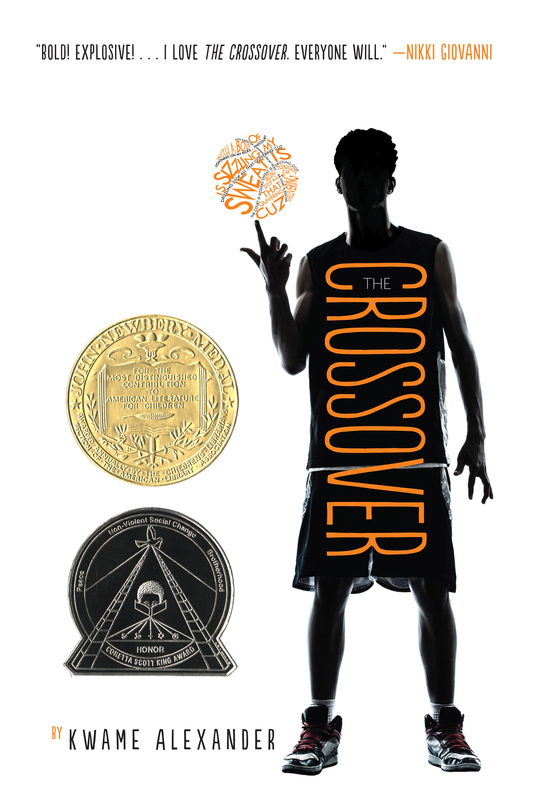 Read together, the poetry of The Crossover told a compelling story. I think if you wanted to draw tween sports fans into the world of poetry, this is an excellent title to offer! In addition, Kwame Alexander has recently come out with Booked, a novel-in-verse soccer-themed story.